With the distraction of the Sense HAT put to one side I've returned focus to getting OptimusPi moving in a controlled manner. 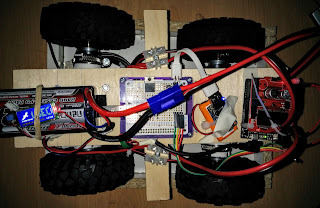 I've previously done a quick test of the motors with a PS3 controller physically connected to the Raspberry Pi, but of course that limits how far the robot can actually move, so its time to switch over to wireless. As I'm trying to avoid having a USB Hub on the robot, trying to keep things compact, I'm using a 'Lindy USB Bluetooth & HS WLAN 11n Combo Adapter' that allows the single USB port on the Raspberry Pi A+ to provided both wireless and Bluetooth connectivity. Then its just a case of following the setup guide from an old MagPi article, strapping everything to the chassis and connecting the power. To keep on top of these various steps I also made sure to update the README with install instructions, just in case I get a corrupted SD card and need to reinstall from scratch. Its a bit messy, but it works. 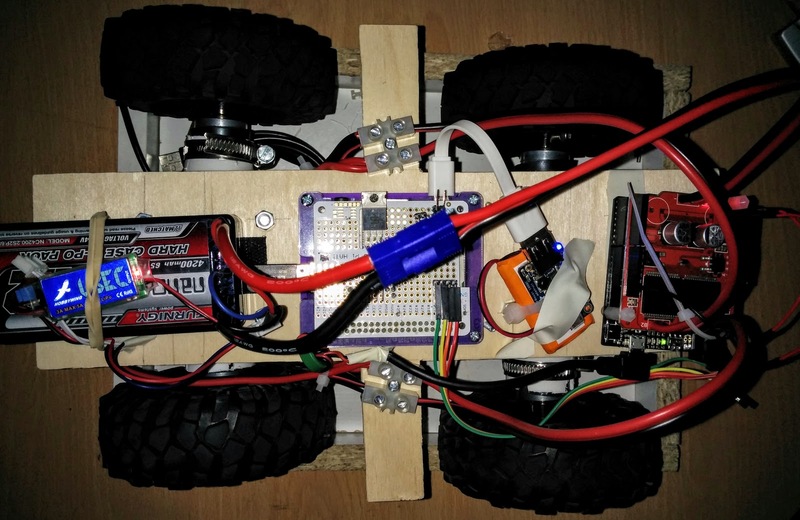 With everything powered up its just a case of SSHing into the Raspberry Pi, running the MotorTest script from earlier and going for a little drive! So a successful first test drive with only 2 real problems. Firstly I've still not fixed in the PVC pipes, so they move when turning, and secondly the motor driver doesn't go backwards on one side, making the turns a little cumbersome. I've checked the software, read the datasheet, examined the hardware and replaced the motor driver but with no improvement. Reading around it seems some of the more cheaply produced versions of this motor board can be unreliable, so to avoid wasting too much more time I've now ordered a completely different motor driver. It's a little less imposing than last years design!